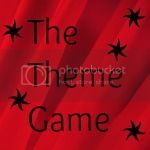 Share the post "The Theme Game Week 4"
So, last week, with a theme of ‘new’ we had so many lovely, uplifting posts to read, thank you. But, we had to choose a winner, and this time that accolade goes to Brummy Mummy of 2, with 3 runners-up as we had a tie this week – Mummy Says, Over 40 and a Mum to One and Mum Turned Mom – well done, all! My Word of the Week last week was actually ‘playing’, coincidentally. I think we do need to find time to play, both for our children and ourselves. Life can be hard, serious, tiring, so if we’ve a chance of staying happy and enjoying ourselves, we need to play and play often, I say. I found this quote (yes, on my Pinterest boards, I know, I know it’s an addiction! ), that says it all for me.. So how about you? What do you think about with our ‘play’ theme? Write that post, grab the badge, link up and ‘play’! I Used To Be Selfish..
Ooh, I like that-reading it makes me feel quite good actually as I do pretty much all of those things with the children in one way or another. Yay! Weirdly thought I’d commented already but perhaps not! Think this reminder of how to play ties in nicely with my interpretation of last week’s theme – so important to remember how to do it and encourage your children to join in and create their own play.